M Aurangzeb Ahmad: What inspired you to write Habibi?Craig Thompson: After BLANKETS, I was sick of drawing high school renditions of myself and mundane midwestern landscapes. I wanted to craft something outside of myself, something bigger than myself, and was considering two trajectories — the classic fantasy epic with dragons and elves and whatnot — or a nonfiction piece of political/social relevance like the comics journalism of Joe Sacco (FOOTNOTES IN GAZA). HABIBI ended up meeting in the middle. On a personal level, I’d always wanted to do a book about sexual trauma, and the characters of Dodola and Zam - two escaped child slaves - were the perfect roles to unravel this story. They arrived in my sketchbook almost fully realized - a gift - but I didn’t know what sort of world they inhabited. I found a home for them in the fantastical landscapes of A THOUSAND AND ONE NIGHTS. I became excited for the latter as a fantasy genre (much like super heroes or crime noir, etc.) and savored the stories for their adventure and bawdiness and humor, but questioned whether these elements were intact from the original arabic folk tales or imposed by a British colonialist Richard Burton. At which point, I sought a deeper reading of these tales in the Islamic arts. 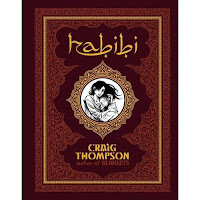 M Aurangzeb Ahmad: What kind of background research did you do in writing Habibi?Craig Thompson: The core of research around HABIBI was simply conversation. I must shamefully confess that before the book, I didn’t have any Muslim friends! Such is the limiting nature of social circles. But HABIBI motivated me to seek those connections/friendships and greatly enrich my life. 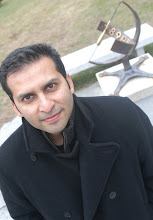 These meditation on Islam and the arabic language was born directly out of my new friendships, especially exploring the vivid connections with my Christian upbringing. 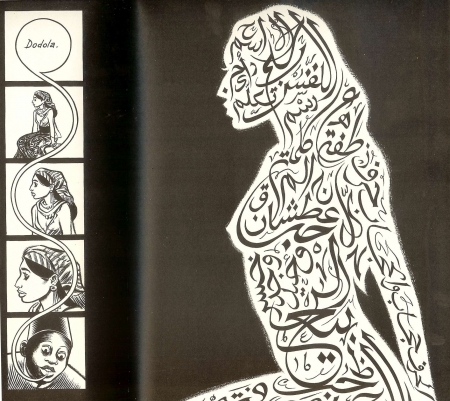 The visual fuel for HABIBI was from book reference - on calligraphy, ornamentation, geometric design, architecture - all these art forms that evolved so profoundly because of a supposed prohibition against representational imagery. Nothing in the book is specific to any geography or time period. Rather it borrows fast and loose from all over the world, Most of all with HABIBI, I trusted my imagination. The backdrop is a dreamscape. The story is a fairytale. The characters of Dodola and Zam are as I described, a gift, that arrived fully realized from outside of me, but that I felt a parental bond to - and a responsibility to explore their stories on paper. 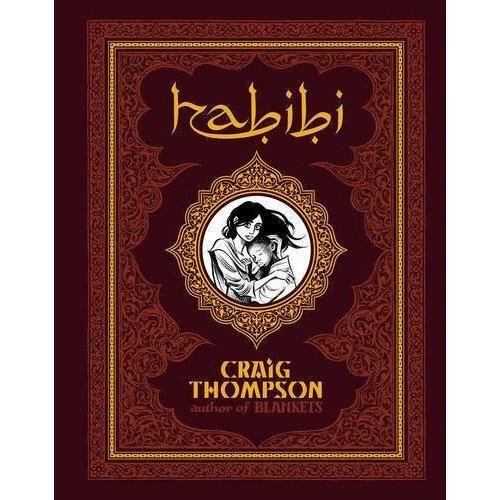 M Aurangzeb Ahmad: Arabic Calligraphy also features prominently in Habibi, what was your inspiration behind that?Craig Thompson: Arabic calligraphy has been described as “music for the eyes” which sums it up perfectly. The cartoonist Chris Ware talks about comics as sheet music - because the reader needs to know how to interpret the symbols, like notation, to unlock the musicality of the page. Ware describes comics as “pictures you READ”. Whereas, calligraphy is words you LOOK at. You can savor arabic calligraphy for its surface aesthetics, as beautiful as any painting, and its fluidity. That fluidity is key. I have great envy of the arabic written language, because Romanized letters are so clunky and abstracted. The fluidity in a language must influence fluidity in culture and worldview. And this is the core thread in HABIBI - when the fluidity dries up or is blockaded - environmentally, emotionally, sexually, and spiritually - how to you restore that flow? wait wait...Is it an Islamic Calligraphy or an Arabic Calligraphy? Not everything Arabic is necessarily Islamic and vice versa.